The EcoSmart A19 15W(100W) LED Light Bulb can be used to replace an A19 100W bulb. The soft white LED light has an 14-Watt of power and puts out 1600 Lumens for up to 15,000 life hours. The energy-efficient LED bulbs offer you an estimated energy savings of $141 per bulb over the course of the bulb's life. This light can be dimmed for convenient light customization and helps conserve energy over the life of the bulb. 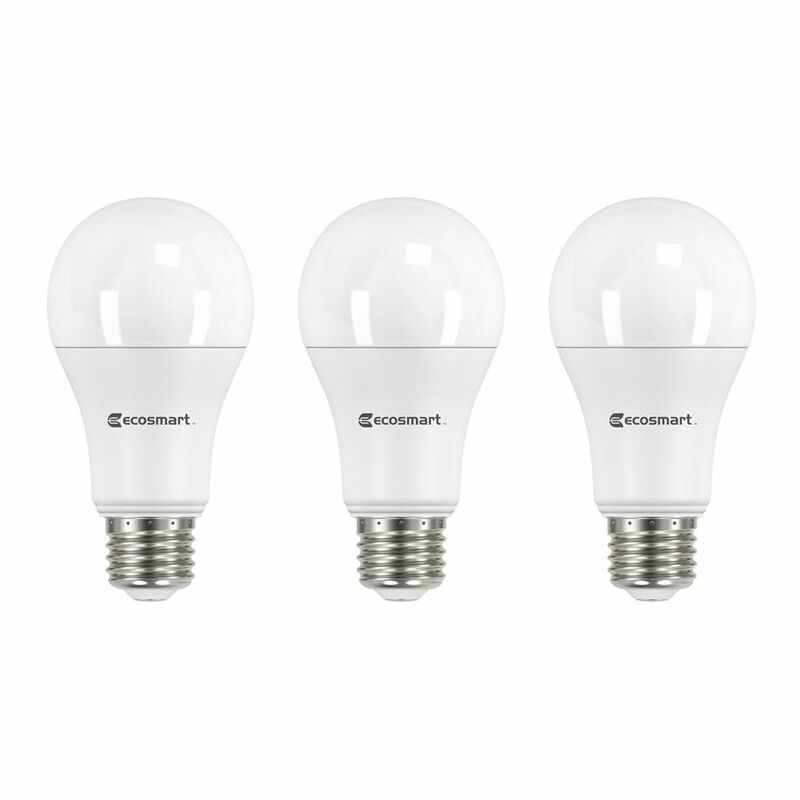 The Ecosmart 100W Equivalent Soft White (2700K) A21 Dimmable LED Light Bulb (2-Pack) has a classic glass filament. This LED bulb provides soft white light similar to a 100W incandescent bulb while generating less heat. It uses 11W and should be used only on 120V, 60Hz circuits. Light appearance: Brightness 1400 lumens, Efficiency 127.27 Lumens/Watts, Energy used 11 Watts, Life 15,000 Hours, Colour rendering index (CRI) 80 CRI. The EcoSmart B10 5-Watt LED decorative bulb can be used to replace an traditional 40W incandescent B10 decorative bulb. This LED decorative bulb has an output of 350 Lumens and can last up to 25,000 hours, saving you up to $96 per bulb over the bulb's life. And it is Ideal for use in ceiling mount, sconces, chandeliers and other candelabra. 100W Equivalent Soft White (2700K) A19 Dimmable LED Light Bulb (3-Pack) - ENERGY STAR The EcoSmart A19 15W(100W) LED Light Bulb can be used to replace an A19 100W bulb. The soft white LED light has an 14-Watt of power and puts out 1600 Lumens for up to 15,000 life hours. The energy-efficient LED bulbs offer you an estimated energy savings of $141 per bulb over the course of the bulb's life. This light can be dimmed for convenient light customization and helps conserve energy over the life of the bulb. 100W Equivalent Soft White (2700K) A19 Dimmable LED Light Bulb (3-Pack) - ENERGY STAR is rated 4.2 out of 5 by 56. Rated 5 out of 5 by DIY from Absolutely love LED light bulbs, especially soft white. Absolutely love LED light bulbs, especially soft white. Rated 5 out of 5 by alisgrandpa from excellent product and fantastic price with the excel special instant discount! excellent product and fantastic price with the excel special instant discount! Rated 5 out of 5 by Doc from Works well. Base is quite warm; I expected it to be cool to the touch. Works well. Base is quite warm; I expected it to be cool to the touch. Rated 5 out of 5 by HomeDepotCustomer from It lights up the whole range and each side so... It lights up the whole range and each side so that I only needed 1 recessed light instead of 2. Rated 1 out of 5 by 200amp from This low score was because the bulbs created our garage door wireless devices (hand held or key p... This low score was because the bulbs created our garage door wireless devices (hand held or key pad remotes) to stop working anytime the bulbs were turned on.The bulbs were not defective but did not come with any warning that they are incompatible when placed within the garage opener motor or in close proximity to it. We replaced these bulbs with 100 watt equivalent Philips LED'S and no more issues. We almost spent $500 on a new garage door opener when the issue was LED bulbs whose frequency disrupted the lift master wireless components. To the manufacturer - Mark the front of the box that highlights incompatible uses - the information they provide on the back is very hard to read and sketchy at best.